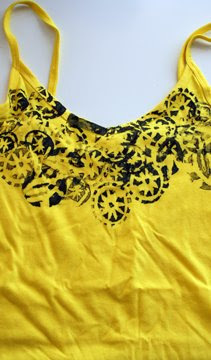 I wanted to share another little project from my current online class Recycling Remix! 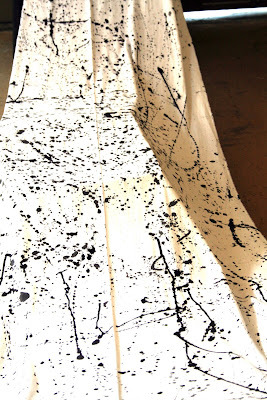 This week is using and reusing fabric in different ways. I started this simple upcycled tank top project at the Long Beach Quilt Festival last week as an example of HOW SIMPLE and COOL carved vegi stamps can be but I have taken the project a little further. 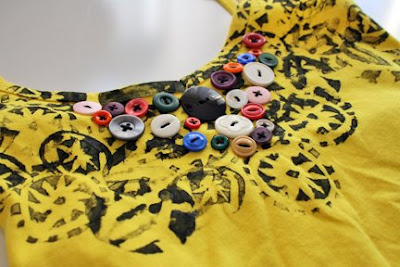 I think we all have a tank top or even t-shirts in our closets that are old or just not very exciting- this simple project will transform plain tops to fun embellished fashion!! 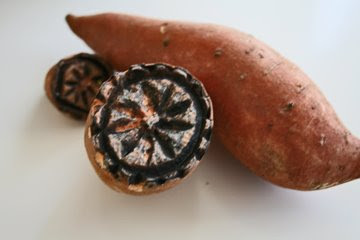 Start by carving a stamp from your vegi of choice (personally I like sweet potatoes the best!) I use wood carving tools but you can also use an exacto blade or even a very sharp knife. 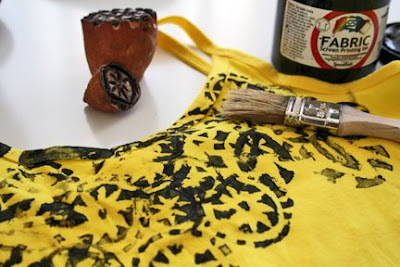 Then stamp all over the tamk top or tee- I used black silkscreen ink but you could also use fabric paint or even acrylic paint (I guarantee none of the above will come out in the wash!) I decided to only stamp around the v of the tank. 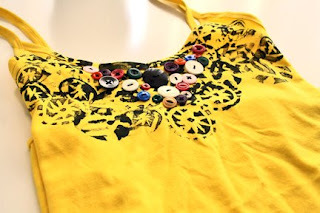 Next, I embellished the tank with colorful little buttons. And...VOILA!!!! A colorful, sassy and one of kind transformed tank!!! 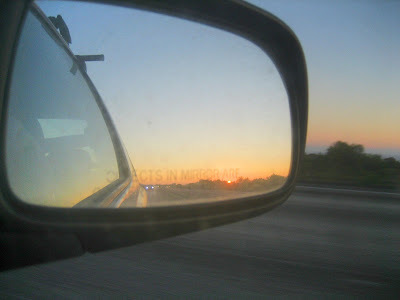 I am finally resurfacing from craziness that has been the last week! I have been in Long Beach at the International Quilt Festival for most of the week teaching at Make it University, meeting all kinds of amazing people and finding inspiration EVERYWHERE! 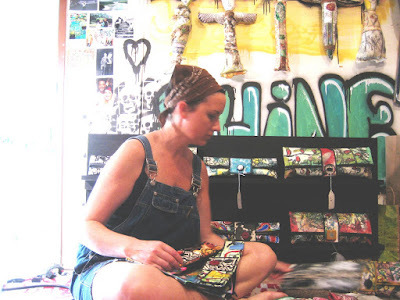 I met up with Traci Bautista and Lisa Engelbrecht to plan a collaborative graffiti retreat this fall at the Art Bar- I will share more info very soon! I finally got to spend some time with the talented Melanie Testa and had lots of wonderful chats with so many creative artists, authors and teachers! It is always AMAZING to get to connect and meet up with like minded people and it only makes me feel oh so thankful to get to be living and pursuing this creative life!! 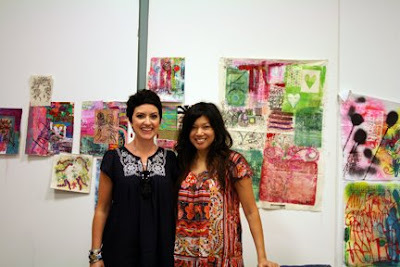 Like last year I was blown away by all of the beautiful work that was on display- so inspiring! Now I am back into the swing of things and though I have only a week or so to prep for ArtUnraveled I am making myself take a day off from everything to let my body and my brain just relax! I have a confession to make...I have been really grumpy this week and I am pretty sure it has to do with the weather in San Diego... IT IS SO HOT AND HUMID HERE!!! This week is was zeppoli- homemade italian donuts- OMG SO GOOD!!! I have also been OBSESSED with my patio garden- I am growing all kinds of flowers, herbs and vegis and I check on the baby lettuce sprouts at least 10 times a day!!! 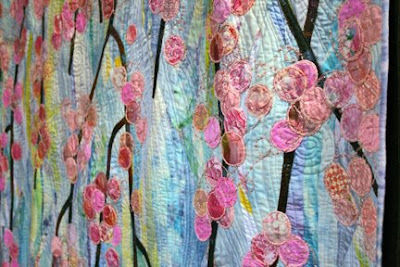 But thankfully I am all ready to be at the Quilt Festival Thursday-Sunday and am looking forward to meeting with all my favorite peeps!!! I will blogging all weekend so stay tuned!!! 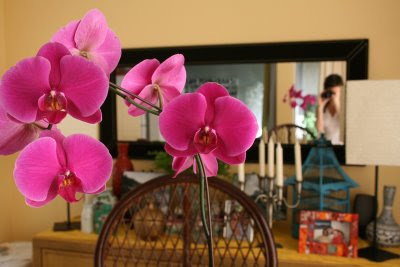 I wanted to share one of the photo demos from my current online class- Recycling Remix! It is 5 weeks of video and photos demos that give you all kinds of simple techniques and inspiration for transforming trash. You can Register anytime in the next 5 weeks so if you are looking for a fun way to get creative this summer- join us online!! 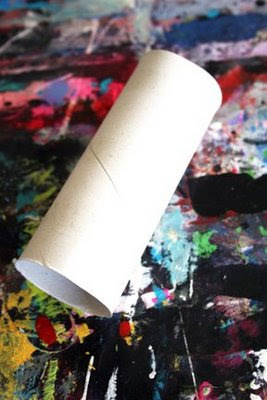 This is a simple way to use toilet paper or paper towel rolls!!! 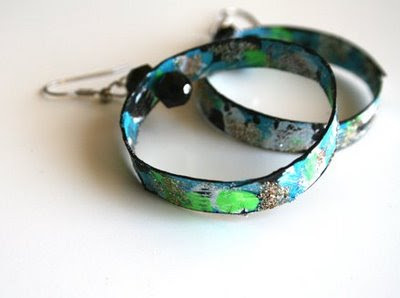 Toilet paper and paper towel rolls are the best for creating unique jewelry! 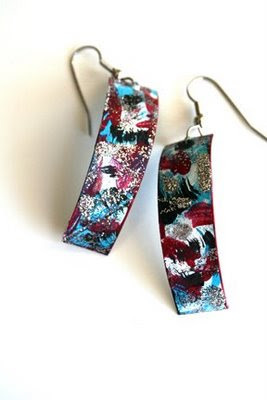 Because of the shape and the material you can make some fun earrings! 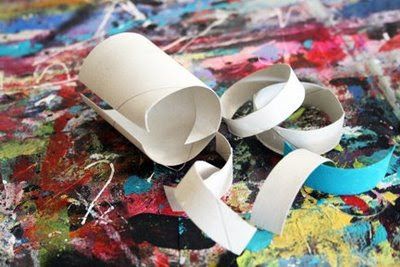 Instead of trying to flatten out the cardboard make use of the curve and cut different shapes and sizes out of the roll. 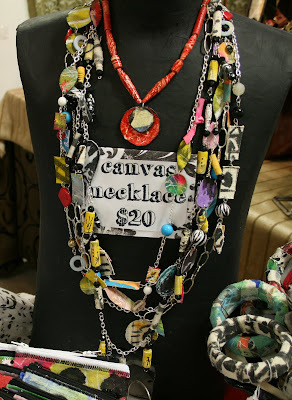 Once the paint is dry, add beads and findings to create unique accessories!! Summer is in full swing here in San Diego- It has been in the 80's, there are lots of tourists in town and at the beaches. Thankfully our house faces the ocean- we get a lovely breeze and an amazing view of the sun sinking into the horizon every single evening which means there has been lots of time spent on the patio, grilling and enjoying the warm nights. 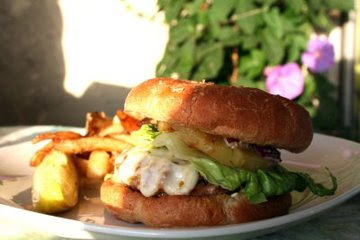 Last night it was grilled turkey burgers topped with pineapple and homemade french fries- SO GOOD! I am trying to slow down a bit and enjoy each little moment! 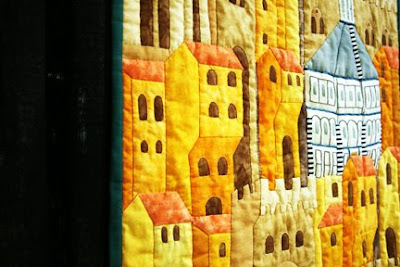 Housework, Quilt Festival and Etsy Sale! In not so boring housewife news I am also getting ready to head to the International Quilt Festival in Long Beach next week So if you are heading to the show or are looking for something SUPER fun to do, come visit me at the Quilting Arts Booth all four days to take a mini workshops or stop by Open Studios and chat with me...I love to chat!! 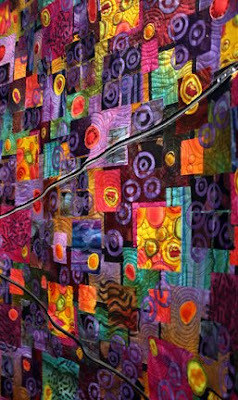 Open Studios- 5-7pm I will be demoing all kinds of my funky and fabulous techniques! Why purchase all of your stamps when you can make some yourself! Learn a variety of unique ways to make your very own handmade stamps with easy-to-use materials. 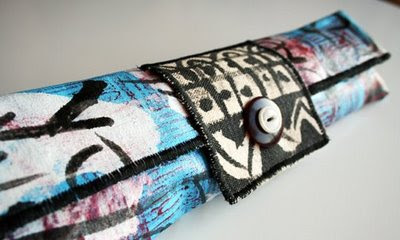 Create a cuff bracelet from painted fabric, buttons, canvas, and an assortment of non-traditional, recycled materials. 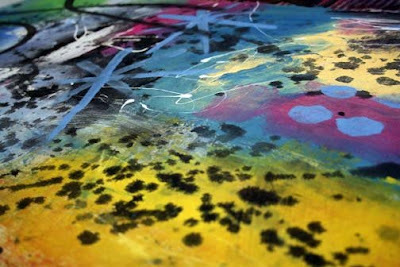 Open Studios-10:15am-12:15pm I will be demoing all kinds of my funky and fabulous techniques! 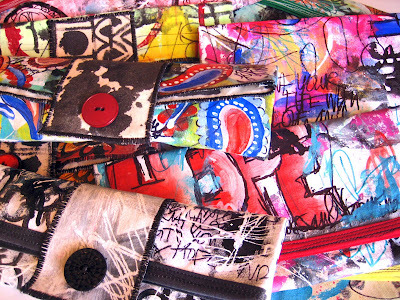 Learn about graffiti and tons of graffiti-inspired techniques that can be applied to fabric, paper, and mixed-media projects. I will be having a SALE in my etsy shop starting tomorrow and through the weekend- all skinny clutches and simple clutches will be $10 off!! In addition to the sale, updates will be made throughout the weekend with all kinds of new stuff!! I am exhausted!! 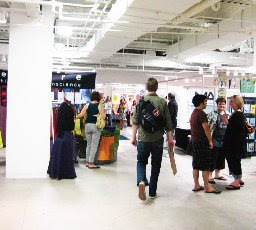 This weekend was the Renegade Craft Fair in Los Angeles, it was held at the California Market Center Penthouse in L.A.'s fashion district. And while the venue was SUPER cool- I couldn't help but be a little freaked out being at the very top of a building in LA- especially when my hubby (who is a structural engineer who does earthquake testing for a living) kept bring up what would happen if there was an earthquake! 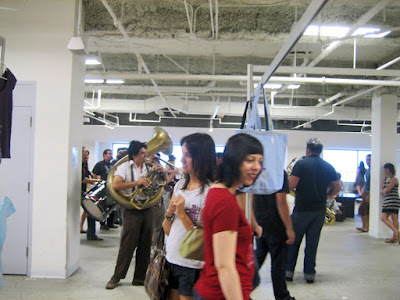 But the views were amazing, the crowd was super hip and weird (its LA!) 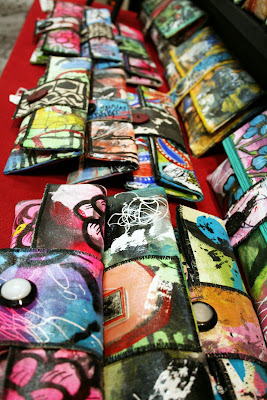 and the vendors were fabulous! Growing up as a "craft show kid" with artist parents, I know from lots of experience that craft shows can be a huge gamble and totally exhausting. But this weekend was worth the while and best part was actually getting to hang with my husband- it was definitely a bonding experience! I have lots of updates to share but they will have to wait until tomorrow...I am way too tired! What day is it? Oh yes it is Wednesday- day number 3 of my first week of being self employed and I am exhausted but in a really good way. I have been working so hard preparing for the Renegade Craft Fair in LA this weekend (please come visit if you are in the area!) and if life was different and the last month had not been spent leaving my day job and then traveling to teach in Oregon (and if I had NOT hurt my back) I would not have to cram all kinds of work into just one week....But miraculously, I am actually on top of everything and just about ready to head up to LA early Sat. morn. 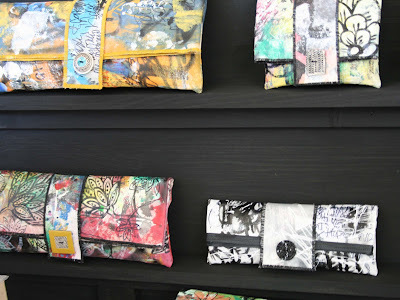 I have piles and piles of colorful clutches, pouches, pencil bags and canvas jewlery to fill up my booth. 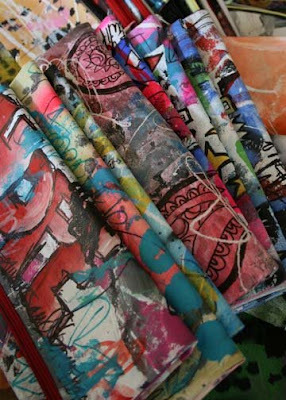 At this point my studio is a crazy (but organized) mess of color and texture- LOVE IT! I am also trying my best to get caught up on email, shipping the last of my etsy orders out and try to begin to plan the next year- unfortunately time is not on my side this week but I will just have to do my best. 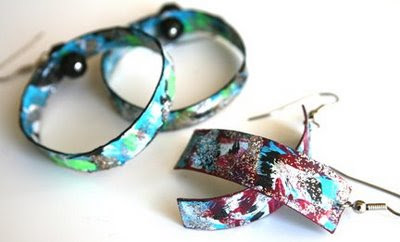 I am also preparing for my next online class, Recycling Remix and I cannot wait- this is my PASSION right now- making art out of trash so check out the information here..its gonna be SO creative and FUN and in my opinion the best one yet! Ok I am off to try and relax for a bit and then it is off to bed and then back to the creative grind tomorrow!! So I am finally back home from my long trip to Oregon and unfortunately the last few days of my trip I threw my back out (AGAIN!!) and since I have been back home in San Diego I have been nursing myself back to good health. I need to figure out how to better deal with my back problems but I am finally feeling better and today was the first day of my new job (working for myself). 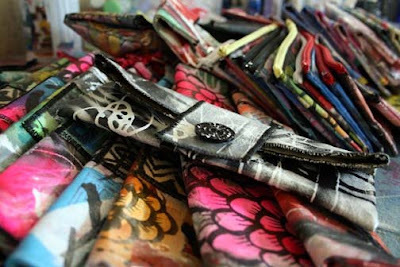 and while I am SUPER stressed making purses and getting prepared for Renegade Craft Fair this weekend- I am thrilled with my first day of my new job :) More to come tomorrow! Peace- What a Strange Feeling!